Dr. Reyna Nguyen was born in Vietnam and migrated to Canada with her family at the age of 9 years old. She grew up in Canada and graduated with Bachelors of Commerce, and Bachelors of Sciences (Biology) in British Columbia. She was subsequently accepted to well-renowed Ivy League, Columbia University for dental school. Following dental school, she completed a one year of General Practice Residency at The Brooklyn Hospital Center and further completed a rigorous hospital-based residency in Oral and Maxillofacial Surgery at the University of Minnesota. Dr. Nguyen obtained full-scope of Oral and Maxillofacial residency; she is proficient in diagnosis and treatment for wisdom teeth diseased teeth extraction, bone and gingival grafting and dental implant surgery for oral rehabilitation, pre-orthodontic exposure and bonding of impacted teeth, pre-prosthetic dentoalveolar surgery, orthognatic surgery (jaw surgery), oral facial trauma, reconstruction surgery of pathology of jaw. During her residency she was involved in several researches where they were published papers in the Journal of Oral & Maxillofacial Surgery. Dr. Nguyen also she served as Chief Resident for the Oral and Maxillofacial Surgery program in the final year of residency. Dr. Reyna Nguyen maintains staff privileges at various area hospitals at the Houston Medical Center where she performs on-call services for the management of facial trauma, oral infection and other related oral & maxillofacial surgery concerns. Dr. Nguyen is a Texas state licensed Dentist and a member of the Texas Dental Association, American Dental Association, and American Association of Oral & Maxillofacial Surgery. 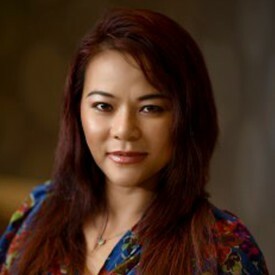 Dr. Reyna Nguyen most rewarding time in her dental career is her externship in Vietnam learning about cleft lip palate surgeries, oral pathology and extensive facial trauma at the University of Ho Chi Minh and National Hospital of Odonto-Stomatology. It was also rewarding to be able to providing dental care to medically-compromised orphans in the HoChiMinh City at a private practice in the Ho Chi Minh City. In her spare time she enjoys traveling and reading journals/literature of her specialty. She is very happy with her relocation to Houston and looks forward to meeting new patients and providing highest quality care to the community as this is truly her passion. 2013-2014 | Oral and Maxillofacial Surgeon, Private Practice, Office sedation, diagnosis and treatment for wisdom teeth/diseased teeth, bone and gingival grafting and dental implant surgery for oral rehabilitation, pre-orthodontic exposure, bonding of impacted teeth, pre-prosthetic dentoalveolar surgery, oral facial trauma, biopsy and removal of oral and facial lesions. On-call, admitting and surgical privileges at Houston Methodist Hospital and St. Lukes Episcopal Hospital Management of facial trauma, oral infection, and other related oral & maxillofacial surgery needs. 2004-2008 | College of Dental Medicine, Columbia University, New York, NY, United States Doctor of Dental Surgery. 2001-2003 | Faculty of Science, University Northern British Columbia, Prince George, BC, Canada Bachelor of Science. 1996 | Faculty of Commerce and Business Administration, University British Columbia, Vancouver, BC, Canada Bachelor of Commerce. Dr. Reyna Nguyen, D.D.S., O.M.S. Available once a month from 8am-6pm for Oral Surgery procedures. Please contact our office to schedule an Oral Examination and consultation.